Hello Friends! I hope you had a wonderful Wednesday. I had a busy, but productive day and for that I am truly thankful. Let's jump right into the color share, cuz this gal wants to go night night! Here is my cast of characters. 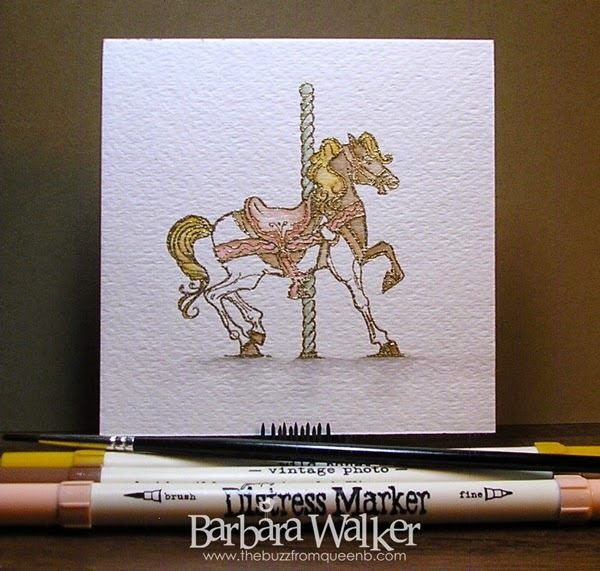 I've had this carousel horse stamp for some time and I've been wanting to watercolor it with Distress markers. So that is what I did today. Since I had created the Distress Marker watercolor sampler yesterday, I knew exactly which technique I wanted to use for this image. Using Versamark ink, I stamped the horse onto the textured side of a piece of water color paper. 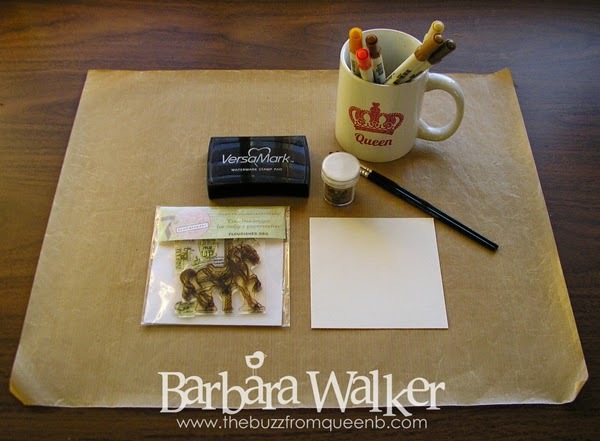 Then, I sprinkled on gold embossing powder and heat set it. I decided to add a little color directly onto the image and then wet it with my paint brush. I love the soft look I achieve when using that technique. I was not able to complete the coloring this evening. I'll finish it up tomorrow. That's the beauty of the challenge, no stress, just good clean coloring fun! Good night! This is a lovely image, Barb! I really like the soft look you can achieve with the distress line of inks. It's also nice to see you stop mid image, so one can see a little of how you progress on the image. Thanks for sharing! This is so delicately done. The colors are awesome. You have mastered so many mediums!